The wall switches for the DELTA i-system (DELTA line, DELTA vita, DELTA miro) have one, two or three horizontally arranged pairs of buttons. A labelling field is placed in the middle between these buttons. 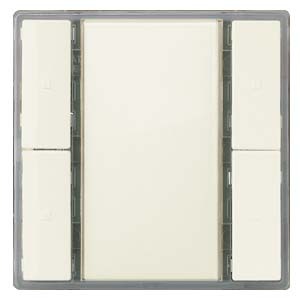 Wall switch single, double and triple, with one orientation LED, without status LED. Wall switch single, double and triple, with one orientation LED and with one status LED per button. Wall switch triple, with one orientation LED, with one status LED per button, scene controller, and IR receiver-decoder. The wall switches are mounted together with the design frame “DELTA line”, “DELTA vita”, or “DELTA miro” onto a bus coupling unit (BTM). At the same time the electrical connection between the wall switch and the bus coupling unit (BTM) is established via the Bus Transceiver Interface (BTI). Bus coupling unit (BTM) and the design frame “DELTA line”, “DELTA vita”, or “DELTA miro” are not included and therefore have to be ordered separately.